I will probably make a couple more of these. 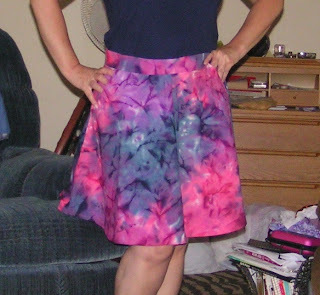 It's comfortable and fits nicely - this was the first time I've graded a pattern to use two sizes and it worked out perfectly. I have two dresses cut out and waiting by the sewing machine but I'm trying to finish my OWL for the House Cup. I might not make it. I've had too many distractions this term and not enough desire to knit a very boring piece of stockinette. I recently signed up for pinterest. I've had so many people tell me that I have to have an account because it's so great and so much stuff is on it and it's a great way to spend time...but I don't care for it so far. The only thing taking up my time is trying to find what I'm looking for. I was hoping to transfer my evernote files over but apparently that's not possible. I've got a couple of boards going so far, one for Doctor Who cosplay ideas, steampunk ones (one is wearables and the other is goodies), and a vintage fashion one. Oh, and a Marilyn one that's not got a lot because I found another Bobbi with a wonderful collection of Marilyn pictures so I just follow her (she seems pretty cool all around, actually, this other Bobbi with the great tattoos). I would love some input on how to add images from places other than pinterest. I've been trying to use flickr as a resource, too, but it has changed and is a bit confusing for me - I couldn't figure out how to add the above image from there so I had to pull it from my computer - and I don't see how to add descriptions. I have favorited some things, though, mostly Pushing Daisies costuming images (I have a sad little pinterest board of PD, too) because it's also a bit difficult to narrow down and specify what I'm looking for. Social websites should really use ravelry as the ideal - so easy to use and understand. I'll be off now - there's fresh fruit in the kitchen that's calling to me. One of the best parts of summer is the yummy food! And guess what! I have over 30 little green tomatoes growing in my back yard. Fresh, delicious BLTs will soon be mine! Mwa ha ha!